Tommy Lee is as infamous as he is famous — part-time drummer, full-time hellraiser. The Motley Crue member — who along with Nikki Sixx, Mick Mars and vocalist Vince Neil will play Abu Dhabi on November 20 as part of the band’s final tour — had a notorious marriage to Pamela Anderson that was a series of scandals you definitely wouldn’t use as topics of conversation with your mother. This in mind, you would think an awkward and potentially prickly interview is on the cards. I am warned by his agent to only speak about the tour and not his personal life, I quickly cross out half my questions and get down to some opening pleasantries with a rock star in the truest sense of the word. I am awesome, Mark [he uses my real name]. How are you? I’m good Tommy. Now, normally, if you get to interview the drummer, it’s the short straw because nobody knows who he is and he lacks anything like the personality of a front man. You are different though — you took the drums from the back to the front metaphorically and, in some cases, in reality, usually on some kind mechanical contraption. I was never one for the passenger seat. I have always wanted my level of entertainment and showmanship to be the same as a frontman. I have always tried [expletive] that was memorable and exciting. Too many drummers sit at the back covered in drums and you never see them. I appreciate that you noticed I make the effort, and thanks for pointing it out. I think it’s you and Animal from the Muppets who are the only drummers that are the most famous members of the band. You are getting towards the end of your time with Motley Crue. Does that finally mean you have your dream drum kit? Yeah! I’m at the stage now where I hit the drum and it lights up. I also have a fully see-through kit now so people can check out exactly what I’m doing. Most drummers are covered with a million drums and everyone is like, ‘what are you doing back there?’ I have the dream drum kit now — a bit different to being a kid, when I only had a snare drum. Is this definitely the last tour? It’s not going to be like Frank Sinatra with comeback after comeback? No, and not like the Eagles or Kiss or any other band I could name. It’s definitely the last one. We decided about seven years ago after a meeting in a hotel room in Japan. We didn’t want to fade off into the abyss and end up playing county fairs, it’s not a good look. We have done what we wanted and in fact kicked the [expletive] out of it. Have you thought about what that last moment on stage on New Year’s Eve will feel like? Realistically when you hit the drum for the final time, you will be the last person making the last sound in Motley Crue. I can’t imagine what that will be like. I think about it every time we play now, because every time we finish a gig, in a small way, it is the last time for that crowd. I tell you what though — it’s going be weird. Man, it’s going to be weird. You have already started planning for the future though, after working on the Smashing Pumpkins’ last record. It was a lot of fun working with Billy [Corgan] and the gang. But they are so different musically. Well, they are more prog rock and the time signatures were so different, but it was an honour to work with them. Final question, and I am hoping for a good answer. What has been your most outlandish backstage demand? It was a kiddie-type paddling pool filled with mud and I will let you fill in the rest. With my mind filled with images of Motley Crue all doing mudpack facials, I bid Lee farewell and polite as ever he says it was great to speak to me and he hopes to see me at the gig. I put the phone down with a changed opinion of hellraiser Tommy Lee. I now see him more as super polite hellraiser Tommy Lee. — Sparky presents Drive With Sparky on Radio 2, 4-8pm weekdays. 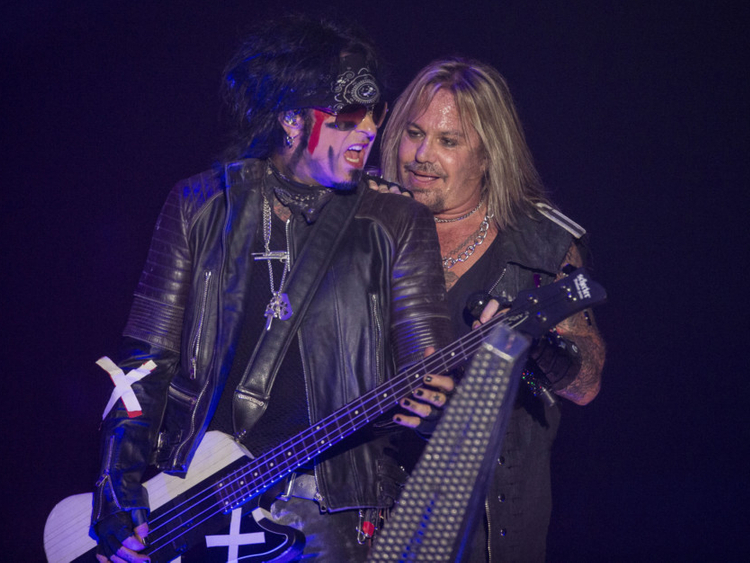 Motley Crue perform at du Arena, Yas Island, Abu Dhabi, on November 20 as part of their two-year Final Tour cycle. The huge production includes plenty of pyrotechnics as well as Nikki Sixx’s flame throwing bass, Tommy Lee’s “Cruecifly” drum coaster, and the “Cruesnest” where fans can sit with the band during the grand finale of the show. Tickets from Dh295 at ticketmaster.ae.